Like many people, I think, this style of warm, hard-wearing and definitively wintery sweater fills me with a very particular kind of nostalgia. I first saw sweaters of this kind when I was eighteen, and went away to University. There I encountered a very particular kind of student who wore this type of sweater – male, outdoorsy, hardy, often studying archaeology or politics, and – yes – most often Scottish. Because it was so strongly associated with a certain type of man to me, I thought of this kind of garment as distinctively Scottish for many years. 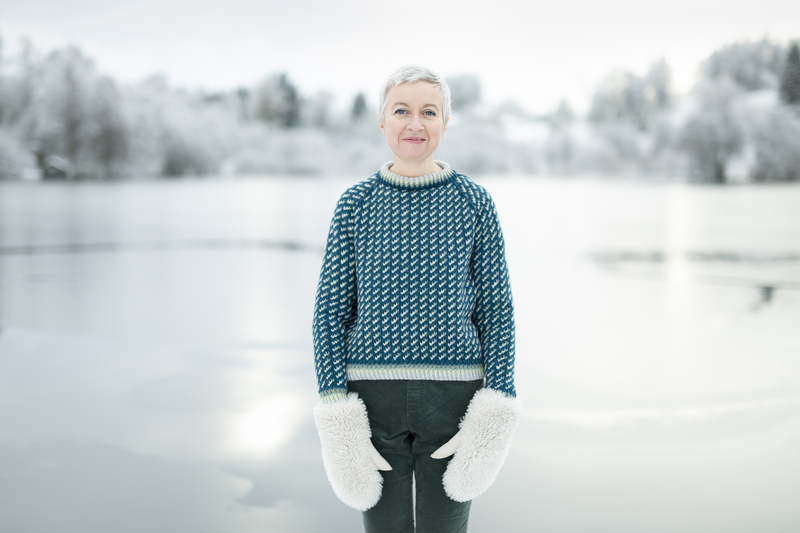 And then, when I moved to Scotland, and learnt much more about knitwear and knitting, I found out that this style was actually Norwegian, and that the dotted patterns on a plain ground were known as “lus”, or lice. Yet in Norway I understand this particular style of garment is known as “Islander” or Iceland-er. As you’ll know from Yokes, I am really intrigued by the shifting regional associations and nomenclature of knitted garments around the north Atlantic. This warm, allover garment seems somehow especially redolent — its appeal particularly long-lasting. For the English teenage me, it became associated with braw Scotsmen; for Norwegians it’s a signature Icelandic style. 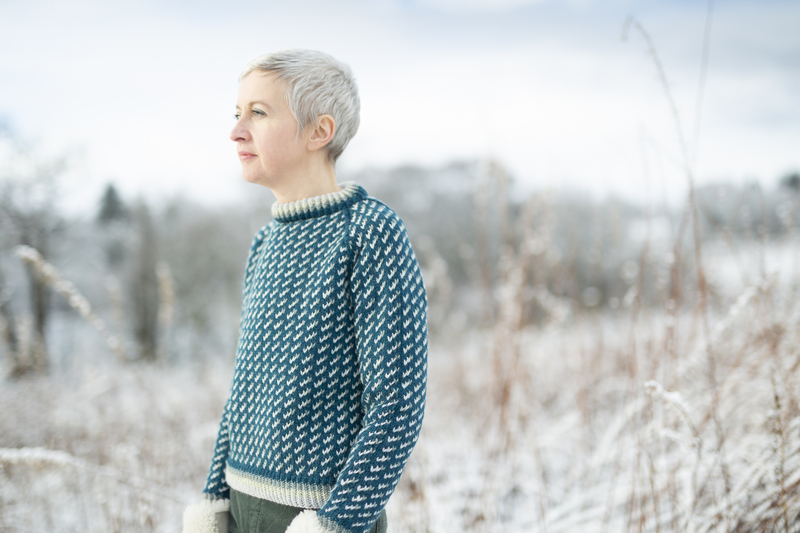 Perhaps this sweater presents an interesting example of how we project our dreams of warmth in winter — our evocative knitwear fantasies — forever further north. So for me this garment carries very strong associations of nostalgia, winter, the great outdoors and (I suppose) braw men. 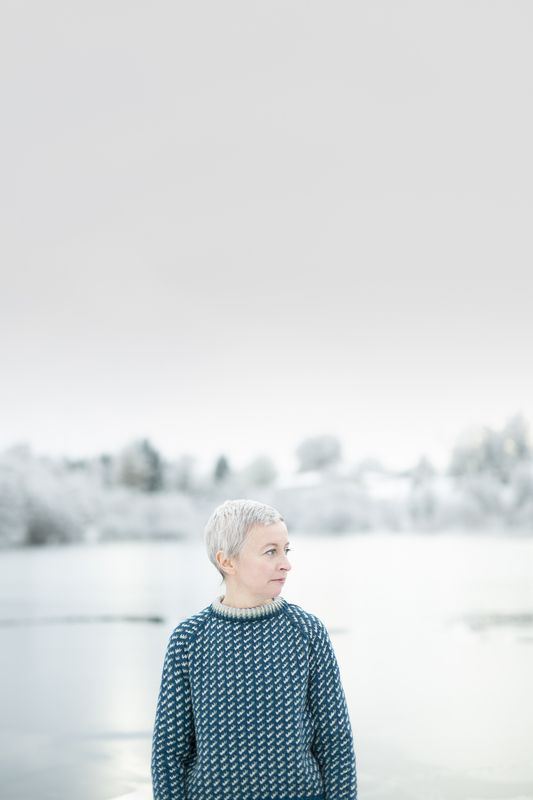 And, in my own way, I do feel braw when wearing it – and this sense of feeling fine by wearing just the right thing for the weather is how the sweater got its name – ‘weel riggit‘ – or ‘well dressed’. What I probably enjoy most enjoy about this design is the distinctive colours, and the way they work together. Four graded shades of Àrd Thìr are in use here: Ardnave (a deep teal-y blue); Camusdarach (a silvery grey); Kiloran (a complex lichen-inspired neutral with yellow-green-grey tones); and Vatersay (another complex, muted shade combining several soft aqua tones). Close to, each shade is individually apparent. . . .
. . . but at a bit more of distance, the whole gradient melds together, to give a satisfyingly cool-toned wintery effect. The yarn’s subtle, tonal range is one of the things I’m really enjoying about Àrd Thìr – you’ll see more of it in the months to come. Weel Riggit is sized up to 56 inches, and when selecting a size, I’d aim for a minimum of 4 inches of positive ease (I’m wearing it with 5), allowing for the reduced inner circumference of the doubled-layered fabric and enabling a comfortable fit over your winter undergarments. The pattern is currently exclusive to the Knitting Season club (which is still open for new members – join us!). For those who have been asking, it will be available as an individual pattern download (from April onwards). Àrd Thìr yarn packs for the sweater are available in the KDD shop, and if you are interested in trying out my new shades, you might enjoy the Àrd Thìr gift sampler. At a gauge of 18 stitches to 4 inches, Weel Riggit is a garment you might knit with a wide range of heavy-worsted or aran yarns. 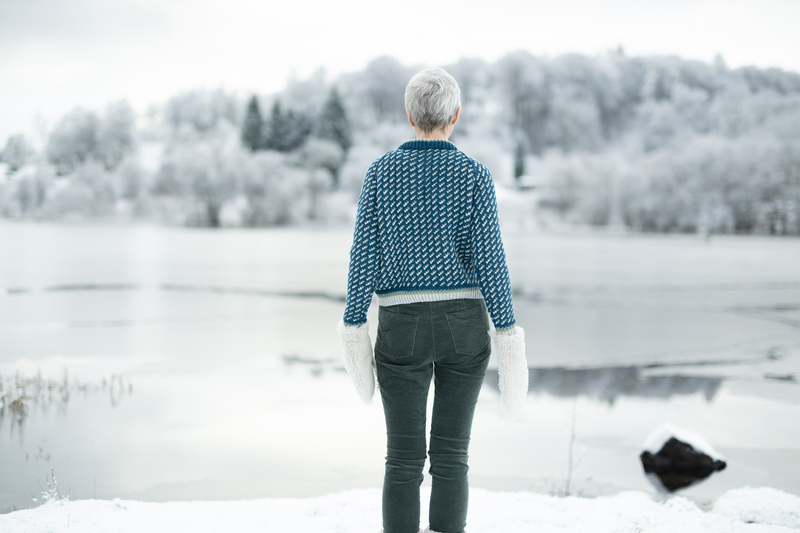 Whatever yarn you choose, and whatever associations this garment has for you, I hope you’ll really enjoy knitting a classic cold-weather garment that should see you through many winters. Be Weel Riggit in your Weel Riggit! My yarn order for the Weel Riggit hat in the blue shades arrived today – moments ago, in fact – and this yarn is stunning! The colors are so beautiful and the yarn feel so good in my hands. Another KDD yarn success! This hat project is my next in line after I finish the Carbeth I’m working. I have been studying and studying the colors on this post and on the new post with the same sweater in greys/browns. Question: on this one (the blue one) are the three v’s all different colors? Or are the lower two v’s the same color and the upper one a different color? I see the lichen/yellow color in the ribbing, yes, but I don’t see it in the v’s/lice pattern. yes, it is there – there are 3 different colours in the gradients of both sweaters. Shades are so difficult to capture . . .
Ah c’mon Kate, you cannot wear the fluffiest mittens ever and NOT EVEN MENTION THEM!! I love them, I love the jumper! I will add them to my mahosive list of things I would like to knit. as an aside; where and how do you store all your knits? My storage overfloweth. OMG where are the mittens from!!??? U.S. outfitter L.L. Bean offered their version (navy and white) at least as far back as the ’70s. It was one of the first items of clothing I bought with my own money. It now sports blue suede elbow patches and paint spatters. I couldn’t possibly get rid of it. I grew up in Alaska wearing this sort of sweater. Love the colors! Kept me so warm! Skiing was a joy wrapped in the warm of the wool. Looks lovely. Absolutely lovely sweater. Will certainly give it a try. I’ve heard said that there’s no such thing as bad weather — only inappropriate clothing. This looks the perfect thing for the cold! Gorgeous sweater…another one, but yours are always fabulous, each new design ! And those massive ENORMOUS mittens, those knocked me over….so warm and cozy looking. I also loved this type of jumper since university. I knew it was Norwegian, though, as there were loads of Norwegians at the University. It was Heriot Watt and there were courses in off shore engineering etc. The guys who wrote them very often had leather rucksacks too. I recently bought one of the traditional Norwegian jumpers with the buckles. I fancy knitting yours up too, it’s lovely. 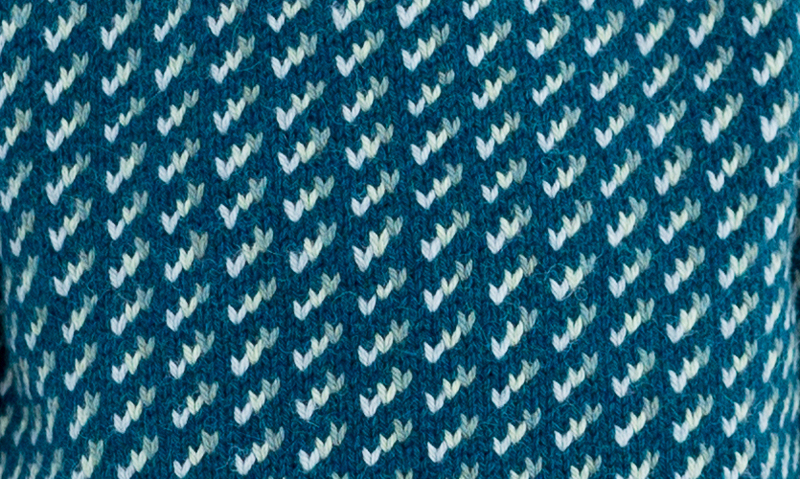 Actually, you find the sweaters with pattern all over (lice, little squares etc. etc.) on the Faroe Islands (Færøerne). 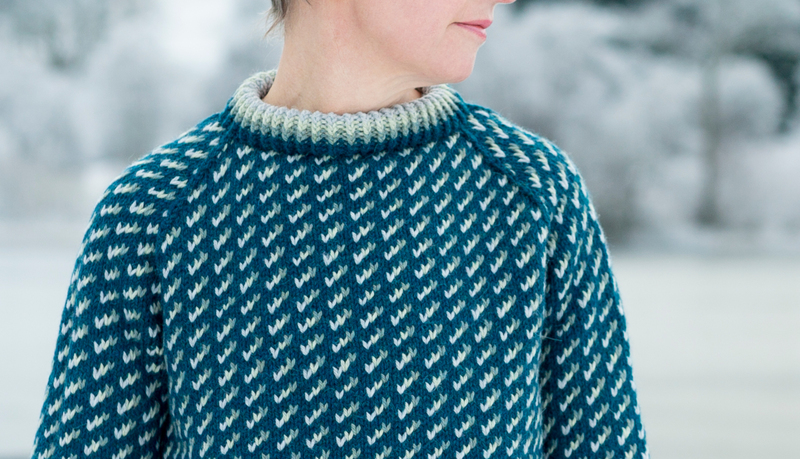 The Islandic sweaters are the ones with yokes and unicolor body. Of cause, there are many combinations of the traditions. In Denmark, sweaters called ‘Islændere’ (Icelanders’), are often of the faroe type, rather confusing. you are of course absolutely right about northern Norway – my notoriously bad sense of direction has clearly taken leave of the compass here. I would say that a lot of Iceland seems harsher than where I was, though! The wind that whips across that island is beyond anything I felt in my protected little fjord. I actually still have, in a pattern book almost as ancient as myself (62!) a pattern for a child’s jumper, in a Norwegian pattern very similar to yours- but with a starry patterned yoke, and my mother knitted it for me, in red and white! I can still remember wearing it…. it’s a gorgeous pattern, Kate- well done! Lovely sweater and I absolutely love your hair. NB However, along those lines, do you know that on your sales page, it says that the ‘Ard Thir Gift Sampler’ is £80.00. Elsewhere it has £8.00, as the price – I guess one of those is a mistake. I’m still working my way through your ‘Colours of Shetland’ book! But then: I’m very, very slow (only began relearning 2 years ago, inspired by your site), plus I only knit in front of the TV – so not that often – and I’m currently knitting a Marianne Isagar ‘fair isle.’ However, l am looking forward to seeing the rest of the collection. The sweater as the writing are beautiful and rich in story, design, and inspiration! Thank you as always! Oh it is lovely. As a student in Aberdeen in the 80s Lopi yoked jumpers were the fashion in a similar way, along with beards. I knitted them for my friends, the payment was the leftover yarn which I used to make myself a sideways knit stripy jumper which I still wear! Old jumpers can have such love in them! I wore a particular marled grey polo neck from age 14 to well into my 30’s. I remember repairing the cuffs by candlelight during the 1973|74 power-cuts. It was worn out and patched up many, many times before it finally came to its end. “Partly because I couldn’t afford a new one, and partly for credibility”, as your correspondent Alison Jaffrey puts it (even though I’m not an archaeologist, I felt it spoke about who I am, or who I’d like to be – someone who owns things she cares about). I studied Archaeology at Glasgow University Kate and you are right , at least half of the male students possessed a Norwegian sweaterwith the allover design in heathery colours. In fact my friend Neil still wears his 35 years on ! Archaeologists are loyal to their old knitwear striped or Norwegian partly because they can’t afford new ones and partly because an old jumper has more trench credibility and distinguishes those who get their hands dirty digging from the armchair variety. Absolutely adore Weel Riggit and can’t wait for my parcel to arrive so I can get started! Today I am wearing a tweedy sweater I knitted about 25 years ago and was interested to note that it has that cropped, boxy and swingy shape you’ve been playing with recently Kate. Can’t wait to see the next designs in the Club.